The Insurrectionists, also known as insurgents, and rebels, are groups of human individuals devoted to complete liberation from the influence of the Unified Earth Government and the United Nations Space Command. They were the UNSC's main enemy during the Insurrection, an undeclared civil war between the UNSC and the numerous Insurrectionist movements across human-controlled space which took place predominantly before the Human-Covenant War, although sporadic conflicts between the two sides have continued since. Some Insurrectionist cells have formed more complex alliances or factions, including the United Rebel Front. They are commonly called Innies: this is an ironic name, as they actually "want out." Insurrectionists are sometimes also referred to as separatists, although there is some distinction between the two terms. Most Insurrectionists originated as disgruntled Outer Colony citizens who perceived the Unified Earth Government as a draconian oppressor and did not believe in advancing their cause through diplomacy. However, a portion of Insurrectionists were also former UNSC and CMA defectors; the entire leadership of the United Rebel Front was comprised of ex-UNSC generals, and the rebels had connections across the UNSC, including FLEETCOM. In addition to those who sincerely believed in their cause of liberation, the movement also attracted a number of opportunists and mercenaries who joined them for monetary gain. Different groups of rebels used a variety of tactics to combat the UNSC, ranging from using sabotaged and suborned industrial automata to ship-to-ship combat. Some factions, including the Freedom and Liberation Party and assorted groups at Epsilon Eridani, resorted to terrorism, striking targets with explosives to sow fear and chaos in the region. Meanwhile, Lyrenne Castilla's group focused on space combat, capturing UNSC warships, such as the corvette Callisto and the frigate Bellicose, and turning them against the UNSC Navy in bloody ship-to-ship duels throughout the Outer Colonies. One tactic among Insurrectionist ground forces was to use performance-enhancing chemicals known as rumbledrugs that radically increased the subject's physical strength and pain tolerance, but would also cause irreversible physiological damage that would kill the user shortly after. Notably, they were used to combat the Spartans due to the temporary superhuman strength they granted. The Insurrectionists, in particular the United Rebel Front, had highly organized intelligence divisions and a far-flung network of facilities, comprised of a network of different rebel movements, such as the cell at Eridanus. They have commanded facilities across human-controlled space, including Eridanus Secundus and Station Jefferson in the Eridanus asteroid belt as well as Camp New Hope on planet Victoria. They also had a high explosives manufacturing facility, operations on Micronesia, and a saboteur cell on Reach. All these operations were shut down by the Spartans of Blue Team. The Insurrectionists possess a multitude of warships and many operate entire fleets. Their most prominent fleet, a ragtag collection of ships commanded by Lyrenne Castilla, would continue to exist well into the Human-Covenant War and unexpectedly aid Admiral Cole in the Battle of Psi Serpentis. Public opinion on the Insurrectionists ranged from sympathetic to adverse; there were also some—such as Jorge-052—who supported the notion of colonial autonomy while strongly condemning Insurrectionist violence. UNSC propaganda and ardent supporters of the central government underlined the unity of humankind as a whole, casting the Insurrectionists as freeloaders unwilling to contribute to the common good. HIGHCOM, along with some proponents of the UNSC, maintained the view presented by Dr. Elias Carver in the Carver Findings; that peace in the colonies could only be achieved through military intervention. Meanwhile, many civilians on Earth and the Inner Colonies, themselves away from the violence, believed that the UEG could have ended the war by meeting the Insurrectionists' demands and giving them their independence. Both the ORION Project and the SPARTAN-II program were created by the UNSC in response to the Insurrectionists, with the intent of producing supersoldiers to pacify the colonies by way of using low-profile special forces to eliminate the rebel leadership in accordance with the suggestions of Dr. Carver. An insurrectionist armed with an M7 SMG. Most Insurrectionist movements stirred in the Outer Colonies, with the war starting in the year 2494, where many colonists started to demand independence from both the United Earth Government and the United Nations Space Command. Many citizens of the Outer Colonies considered the Earth government to be oppressive and imperialistic, partly due to their having to pay taxes to the Inner Colonies and general opinion the that Earth did not represent them. Over the next two decades, the fighting spread to some of the Inner Colonies, particularly the Epsilon Eridani system, the heart of the UNSC military. Around 2511, the rebels based in the Eridanus system had overthrown the colonial government of Eridanus II and largely controlled all activities within the system. The UNSC responded harshly, seeking to put down the rebellion forcibly. Also in 2511, a major insurrectionist terrorist attack occurred on Mamore, when rebels detonated a nuclear device in the Haven arcology, killing two million people and injuring 8.3 million. Starting in 2513, Operation: TREBUCHET was one of the largest and farthest reaching operations ever conducted in UNSC military history. It was devised in order to rid UNSC-controlled space of the insurrectionists once and for all. In 2513, a space battle occurred between the Eridanus rebels and the UNSC as part of Operation: TREBUCHET. During the battle, the UNSC achieved a Pyrrhic victory with the loss of four destroyers. However, elements of the rebellion escaped into the nearby Eridanus asteroid belt and established a major base of operations there. In 2525, the Office of Naval Intelligence reported that it had uncovered a breach within UNSC Fleet Command: there were several spies for the Insurrectionists within FLEETCOM. They had also discovered that the rebels were led by Colonel Robert Watts and that they had connections to the outside world and were being supplied by outside sources such as the cargo freighter Laden. That year, a group of SPARTAN-IIs underwent a covert operation and captured Watts from the very heart of the rebel operations base, the rebel stronghold at Eridanus Secundus, killing many rebel soldiers and civilians who were present at the base. Following the beginning of the Human-Covenant War in 2525, Operation: TREBUCHET was promptly abandoned due to the Covenant threat. Despite the common threat for all mankind, many Insurrectionist movements continued to live on, still causing problems for the UNSC and forcing them to fight a two-front war: one against the Covenant and one against the insurrectionists. Circa 2525-2526, UNSC forces were sent to put down Insurrectionist forces on Jericho VII. ODSTs were deployed on the planet for over 131 days, being dropped on a rebel stronghold at one point. Around the same time, a group of Insurrectionists were engaging UNSC Marines and Spartan-IIs when both sides came under attack by the Covenant; the two groups subsequently fought together against the aliens. That same year, an Insurrectionist cell on Alpha Corvi II led by Captain Whitaker allied themselves with SPARTAN-II Blue Team when the Covenant invaded the planet. Despite this truce, the Spartans' superiors abandoned their rebel allies, resulting in the complete annihilation of the rebels despite their invaluable assistance to the UNSC. By 2531, SPARTAN-II Blue Team was deployed to root out Insurrectionist operations over the course of several months. They disrupted rebel operations including Station Jefferson, the destroyer Origami, a saboteur cell on Reach, an incident in Micronesia, and a high-explosives manufacturing facility at an unspecified location. In response, the rebels gathered three stolen FENRIS nuclear warheads at Camp New Hope in a way so sloppy that the Office of Naval Intelligence easily noticed, then contacted the UNSC and offered to trade the nukes in exchange for medicine for their people allegedly suffering from Boren's Syndrome. The rebel leader, General Howard Graves, then set a trap for Blue Team, whom they anticipated would be sent. During the raid on Camp New Hope, the rebels successfully ambushed John-117, Fred-104, Kelly-087 and Linda-058 by using an antigravity plate. However, the rebels were unaware of the presence of a fifth Spartan; a new addition to the team, Kurt-051, who had avoided the trap. Kurt was able to free the other members of Blue Team and they then retreated from the camp with the recovered warheads before the camp could launch a proper counterattack. General Graves was killed in the process. During the Human-Covenant War, Insurrectionists from the Outer Colony of Madrigal colonized and inhabited the Rubble, a sophisticated asteroid habitat orbiting the gas giant Hesiod. In the Rubble, an uneasy truce existed between the humans and the Kig-Yar who had originally helped the Insurrectionists build the habitat. While the most of the Rubble's population were Insurrectionists, the Rubble also protected most of the surviving civilian populace of Madrigal. During the Battle of Psi Serpentis in 2543, Insurrectionists actually helped Admiral Cole. During the battle, an insurrectionist fleet led by the Bellicose suddenly entered the battle and launched a blitzkrieg-style attack against the Covenant fleet, decimating it, then just as it appeared the insurrectionist fleet jumped right back into slipspace. Ironically, this was the same ship Cole engaged three times earlier in his career. By 2552, most remaining Insurrectionist factions had ceased active aggression against the UNSC in order to concentrate on surviving the seemingly unstoppable Covenant advance. Still, some rebel movements actively opposed the UNSC on worlds such as Harmony and Reach as late as 2552. In 2552, the Spartans returned to the Eridanus asteroid belt aboard the UNSC Gettysburg-Ascendant Justice hybrid vessel to make repairs. Governor Jacob Jiles was the leader of the rebels at that time. Jiles engaged in a brief "showdown" with UNSC Vice Admiral Danforth Whitcomb, in which Whitcomb threatened to fire Ascendant Justice's plasma turrets, while Jiles claimed to aim nuclear weapons at Ascendant Justice. The two soon revealed to one another that all but one of Whitcomb's plasma cannons were nonfunctional and that Jiles' nukes were fake. Suddenly, a Covenant cruiser that had followed the trail of the vessel appeared in the system. After a short fight, the Covenant ship was destroyed after dealing severe damage to the Gettysburg-Ascendant Justice. Several days later, three dozen Covenant vessels appeared in the system, forcing the Gettysburg-Ascendant Justice to retreat. The Covenant then eradicated the base entirely. The Eridanus rebels were massacred in the process. After the end of the Human-Covenant War in 2553, many Insurrectionist movements which had ceased their operations during the war began to resurface. Entire colonies under Insurrectionist control had intentionally cut themselves off the UNSC's communications relay network during the war. Despite the UNSC's attempts to broker peace with the surviving Outer Colonies and Fleet Admiral Terrence Hood embarking on a diplomatic mission to discuss reconstruction, entire colonies refused and cut all ties with the UNSC, which, according to them, had abandoned them during the war. After the end of the war, many Insurrectionist cells were also able to acquire copious amounts of Covenant and UNSC weapons and equipment circulating in the black market. Of particular significance to the reemerging Insurrectionist movement was the colony of Venezia, which had become a nexus for rebel operations during the war, its Insurrectionist government having declared itself sovereign and eliminated the local CAA authorities. The Wetwork armor, a variant of the MJOLNIR (GEN2) armor, was tested against the United Rebel Front on Talitsa. The Oceanic armor was used against the United Rebel Front as well on Terceira. In January 2553, a group of Insurrectionists led by Ilsa Zane of the New Colonial Alliance attempted a hostile takeover of the UNSC Infinity. The attack was repelled, largely due to the efforts of Spartans Sarah Palmer and Edward Davis. This incident exposed Admiral Mattius Drake as secretly the leader of the New Colonial Alliance. In March 2558, Captain Daniel Clayton joined Admiral Drake's New Colonial Alliance and sought vengeance on Admiral Hood after discovering he acted as a benefactor throughout his entire career in an attempt to make up for the loss of his father, Captain James Cutter, and the UNSC Spirit of Fire. Having learned of Lord Hood's diplomatic mission to Ealen IV, Captain Clayton leaked intel about the peace talks and employed the help of a Sangheili mercenary, Vata 'Gajat. On March 5, they led an attack on the peace conference. The tide of the battle changed when the delegation reestablished communications with their orbiting fleets and escaped from the planet. Not wanting to risk being identified, Clayton and 'Gajat retreated before the UNSC Infinity and their allied Sangheili and Jiralhanae ships could engage them. After their failed assault on Ealen IV, Captain Clayton lured Admiral Hood and the UNSC Infinity into a trap. They launched a freighter, the Pilgrims Pride, which sent out a distress signal that was later picked up by Infinity. When Infinity arrived in the Artesia-702 system, it found the damaged freighter leaking atomic matter with faint life signs aboard and tugged the ship into one of its deployment bays. An ambush was sprung within the bay when the freighter set itself to self-destruct and multiple UNSC aircraft exited its cargo bay. The attack was repelled and Infinity later discovered the assault crafts used were from the Spirit of Fire. Infinity tracked the freighter's origin to Oth Lodon where it found a Covenant space station operated by NCA forces. Captain Clayton revealed himself and his motives to Lord Hood and fired on Infinity with the station's energy projector. In the battle that followed, Admiral Hood was injured and the Infinity suffered serious casualties among its command crew, but remained operational and deployed its Spartan-IV personnel commanded by Sarah Palmer to retaliate against the NCA assault. The NCA operatives aboard and Captain Clayton himself were quickly incapacitated and captured, but their allies in Vata 'Gajat's mercenary faction were also present and attempted to assault Infinity. This attacked failed when the Spartans used the station's main cannon to destroy 'Gajat's vessel, killing him and subsequently taking the surviving NCA personnel into custody as the damaged Infinity was reinforced by the UNSC. A major rebel group, the United Rebel Front is a well-organized alliance of several insurrectionist cells across multiple star systems. It was led by three turncoat UNSC generals, one of whom, General Graves, was killed by Spartan Blue Team on Victoria. Insurrectionist soldiers in Eridanus Secundus. The Eridanus-based rebels utilized numerous vessels, including upgraded Pelican dropships, Mako-class corvettes, and Chiroptera-class stealth vessels as an improvised fleet. They had at least a hundred such vessels in their fleet at any time. Two Laden-class freighters were also used as part of their improvised fleet, being used to tow the damaged hybrid vessel Gettysburg/Ascendant Justice back to Eridanus Secundus. They received almost everything in their armament and ships from pirating other vessels, including both civilian merchant vessels and UNSC warships. They also used Parabola-class freighters such as the Laden, to ship diverse equipment, resources, and weapons from planet systems to their base. Their ability to infiltrate the UNSC ranks caused the UNSC to keep a small orbital force in the system to respond to rebel attacks. Another reason for their success was their location, which was extremely difficult and time-consuming to discover and was easily defended against even medium-scale assaults. Camp New Hope, the headquarters of Graves' rebel cell, had an impressive security system, even by Spartan standards: motion and seismic sensors, a triple layering of guards, trained dogs and overhead MAKO drones. They also had a number of arms, ranging from military grade MAKO drones and FENRIS nuclear warheads to Archer missiles and .30 caliber "Confetti Maker" machine guns. They also made use of a jury-rigged Warthog armored personnel carrier. They possess some "old technology that never panned out", such as the antigravity plate, which Graves' cell used to fool the Spartans' armor systems into thinking they were in a 10 G environment, temporarily giving them decompression sickness, otherwise known as "the bends." The Secessionist Union was a small insurrection group on the planet, Harvest. Their leader, Jerald Mulkey Ander, was assassinated by Corporal Avery Johnson during Operation: KALEIDOSCOPE. An unnamed rebel group operated against the UNSC on the planets Harvest and Arcadia, with possible influence on other colonies. The seal of this organization is of a stylized white fist on a red circle, and is found on nearly all of their units. They mainly used stolen technology from the UNSC. The Freedom and Liberation Party was a terrorist group on Mamore. The group claimed responsibility for the Haven arcology bombing in 2511, and later demanded that the Colonial Military Administration leave the Eridanus sector. 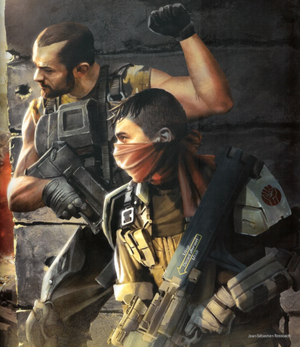 This rebel group was known to have operated on Reach, and its ultra-radical wing was initially suspected of causing the communications blackout at Visegrád Relay before the discovery of Covenant forces. Throughout the Human-Covenant War, the Insurrectionist movement established a base of operations on the colony world of Venezia. All contact with the colony was lost by 2543 and it is presumed to have come under the control of an Insurrectionist government as the colony remained intact in 2553. They are suspected to be planning a strike against Earth in a direct assault on the resurgent Unified Earth Government. Taking advantage of the disparity of the post-war situation, the Insurrectionists on Venezia had managed to acquire heavy weapons of both Covenant and UNSC origin, such as Type-38 "Tyrant" AA cannons and M71 "Scythe" AA guns. This group had a cell operating in the Sol System on Mars. Two of its members, Christina Rice and James McCann, were disguised as UNSC Army specialists working in New Harmony, Mars, where they were stealing weapons for a possible attack. They were arrested on April 2, 2526 by UNSC forces working alongside ONI agents. The New Colonial Alliance is an Insurrectionist group active after the Human-Covenant War. This group was led by Admiral Mattius Drake who was secretly an Insurrectionist. Another prominent figure in the movement was a former Spartan-IV defector, Ilsa Zane. The NCA was responsible for a failed takeover attempt of the UNSC Infinity in early 2553. The rebels gained control of the ship, but they were eventually defeated by Spartan-IVs Sarah Palmer and Edward Davis. The surviving Insurrectionists were captured by the UNSC, while Zane was covertly retrieved after being kicked out into space. The failure of this attack resulted in the UNSC discovering Drake's true loyalties. In 2558, a captain called Daniel Clayton joined the NCA and allied himself with the Shipmaster Vata 'Gajat. Clayton informed 'Gajat about an attempt at peace negotiations between the Sangheili and Jiralhanae on Ealen IV. His alliance foiled the negotiations. The emblem of one Insurrectionist group. Halo Wars concept art of an insurrectionist. A group of insurrectionists on Harvest. An Insurrectionist speaker in Halo Legends: Origins. Colonel Robert Watts, a prominent Insurrectionist leader in Halo: Fall of Reach. The rebel base of Eridanus Secundus. "Ex-Terra" fist emblem on the wall of an Innie stronghold circa 2526 in Halo 4: Forward Unto Dawn. An Insurrectionist seeks a truce with a SPARTAN-II supersoldier circa 2526. Insurrectionists flee to UNSC lines after being attacked by the Covenant circa 2526. Ilsa Zane, a former SPARTAN-IV who attacked the UNSC Infinity. Daniel Clayton, former UNSC Naval Captain collaborating with Covenant mercenaries in Halo: Escalation. Maya Sankar, a rebel leader secretly working for the Office of Naval Intelligence in Hunt the Truth. Cut concept of John-117 fighting Insurrectionist robots in Halo 5: Guardians. Unidentified rebel flag in Rocket League as an unlockable antenna for the base cars to use. ↑ 9.0 9.1 Halo: Evolutions - Essential Tales of the Halo Universe, "The Impossible Life and the Possible Death of Preston J. Cole"